Dress code: Please where comfortable, athletic-style clothing that allows for mobility, such as t-shirts, tights, leggings or sweatpants. Shorts are discouraged because the backs of your knees will be more comfortable hanging on the bar if your skin isn’t bare. If you have long hair, tie it back. 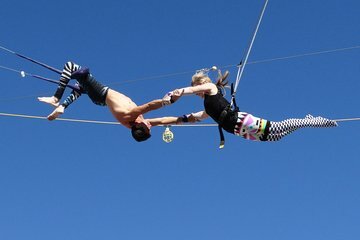 You must wear socks, and shoes must be removed before flying on the trapeze.